Living with Ulcerative Colitis and Fructose Malabsorption. Celebrities and public figures are often the people we see as our role models or sources of inspiration, and when we find out that they have the same sorts of illnesses, it can make us “regular” people feel just that little bit better! During my research, I was surprised to find that there are numerous famous people that suffer from IBS and IBD. For their perseverance and achievements despite their illnesses, here is a list of the people that I find to be most inspirational. Anastacia – I first found out about Anatascia having Crohn’s Disease shortly after being diagnosed with Ulcerative Colitis. Already a big fan of her music, I was very impressed by her story. Anastacia first noticed symptoms of Crohn’s Disease when she was a teenager, going on to have a large mass, lymph nodes and a piece of her intestine surgically removed. Initially, while taking liquid steroids to reduce her symptoms, she suffered from the side effects of hair loss and weight gain, and as a result became depressed. In her mid-20s, she slowly began to accept Crohn’s Disease as part of her life, even choosing to show the scar on her belly when performing (see image below), of which she was previously very self-conscious. Amy Brenneman – Brenneman was diagnosed with Ulcerative Colitis during her second pregnancy. In 2010, she had surgery to have her colon removed, and consequently now uses a J-pouch. An Amercian actress, she is well known for her roles in TV shows Judging Amy and Private Practice, and is also an ambassador for the Crohn’s & Colitis Foundation of America. Jennifer Esposito – An American actress, model and dancer, Esposito is known for her roles in I Still Know What You Did Last Summer and Blue Bloods. She has her own blog where she writes about her experiences with Coeliac Disease, aiming to help others with their experiences. Cam’Ron (Cameron Giles) – This American rapper and actor has suffered from an ulcer and a hernia as well as IBS, and as a result gave up drinking to help reduce his symptoms. He has even written a song about his struggles with IBS. Mike McCready – The lead guitarist for American band Pearl Jam, McCready first spoke publicly about his struggles with Crohn’s Disease in an interview with Fox News, describing difficulties with managing his symptoms while on tour. He is a good example of someone who is determined to live a full life even while suffering from IBD. Cynthia McFadden – An American journalist with ABC News, McFadden has suffered with Crohn’s Disease since her first year of college, when her abdominal pain was nicknamed “George” by her friends. She had 15 feet of intestine removed in 1979, and now has very few symptoms. Despite her condition, she went on to become a very successful journalist, aiming to fulfil her dream of becoming like her idol, Walter Cronkite. She also works with the Crohn’s and Colitis Foundation of America to raise awareness about IBD. Whoopi Goldberg – A very successful American actress and comedian, Goldberg’s version of the “Got Milk?” advertisement (below) featured lactose-free milk, due to the fact the she is lactose intolerant herself. Jeff Hordley – Known for his role in British TV show Emmerdale, this British actor began to experience symptoms of Crohn’s Disease when he was 20 years old, and was diagnosed 6 years later. Hordley has spoken of having to drop out of classes and performances during his university studies due to his condition, and eventually had to have surgery to remove the affected parts of his bowel. He has discussed that running regularly and focusing on his fitness has helped to improve his symptoms. Chuck Lorre – Known as the creator of Two and Half Men and The Big Bang Theory, the American television writer, producer, director and composer was diagnosed with Ulcerative Colitis in 1976. He has spoken of not being able to afford to see a doctor when he first experienced symptoms, and that as a result he believes access to health care is very important. Katrina Chambers – An Australian reality TV star from the 2011 season of The Block, Chambers has spoken about struggling with symptoms of Crohn’s Disease during filming, which were exasperated by the stress of the show. She has also developed arthritis due to the condition. She writes about her experiences with Crohn’s Disease on her blog, and is an ambassador for Crohn’s & Colitis Australia. Sir Steve Redgrave – A British rower, Redgrave was diagnosed with Ulcerative Colitis in 1992, and then diabetes in 1997, but he was determined to fulfil his goal of winning gold at in the Olympics. He was very successful in this, becoming the only rower to win five gold medals in five consecutive Olympics after gold at the Sydney 2000 Olympics. Now retired from rowing, he is an author, philanthropist and motivational speaker. Denise Lewis – A well known British athlete, Lewis first experienced symptoms of IBS in 1992, which later caused her to have difficulties during a Birmingham athletics competition in 1993. She then had a more severe episode during the 2001 World Championships in Edmonton, Canada, ultimately leading to her withdrawal from the competition. She eventually discovered in 2011 that the cause of her symptoms was lactose intolerance. Scott Speed – An American race car driver and former member of the Scuderia Toro Rosso Formula 1 team, Speed first experienced symptoms of Ulcerative Colitis when he was 19 years old. His symptoms were exasperated by the high level of stress of races, and when he was 21 years old, he had lost control of his bowels and forced to wear diapers. In 2004, he was advised by doctors that he needed a colostomy; however, he refused because this would end his racing career, and instead chose to manage his condition through medication. Despite his illness, he went on to compete in 34 races, and win two championships. Thomas Menino – The former Boston Mayor, Menino was diagnosed with Crohn’s Disease in 2004. Despite this, he went on to become Boston’s longest-serving mayor, being elected for his fifth four-year term in 2009. 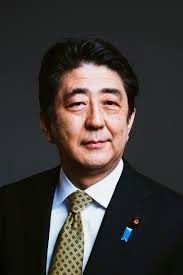 Shinzo Abe – Abe (below) was diagnosed with Ulcerative Colitis after graduating from university, and it is believed to have been a major factor in his decision to withdraw from office during his 2006-2007 term as Prime Minister of Japan. After returning to campaigning in 2012, he spoke of making a “full recovery” due to his medication, Asacol, and was ultimately successful in being re-elected as Prime Minister. Dwight D. Eisenhower – Former US President Eisenhower was diagnosed with Crohn’s Disease in 1956. Despite his struggles and surgery, he served as commander of the WW2 Allied Forces, and was successfully re-elected for a second term. William Wilberforce – A prominent English politician during the 18th century, Wilberforce was believed to have suffered from Ulcerative Colitis, which was possibly the reason for his usage of opium for most of his life. He is known for being one of the leaders of the movement to abolish the slave trade, and leading the campaign for the 1807 Slave Trade Act. Disclaimer: I am not a nutritionist, chef, doctor or other medical professional. All information presented on the Belly Burdens blog is solely based on my own opinions, experiences and research, and may not be suitable for your circumstances. Please consult a medical professional before making any significant changes to your diet or treatment plan. Artwork credit: Percy Saphinia Cosplay.